Home Health Common Horse Skin Diseases: Symptoms, Treatments, and More! 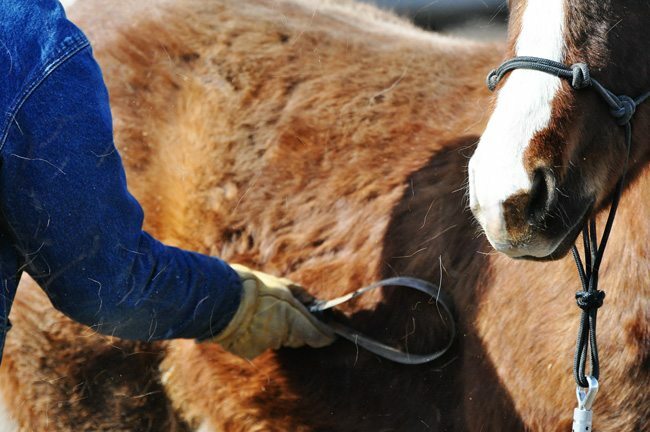 Despite your best efforts, your horse will suffer from skin diseases at some point during its lifetime. Fortunately, not all equine skin diseases have to be deadly, but it doesn’t mean that you should ignore the problem either. In this post, we’ll be discussing some of the common skin diseases in horses, including symptoms, and treatments. 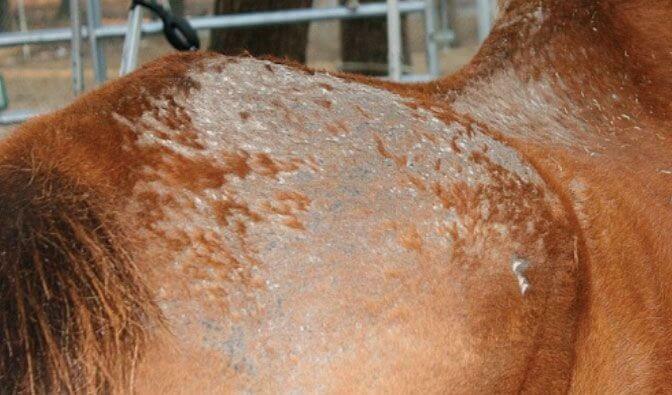 Rain scald, or horse rain rot, is a type of skin infection that’s caused by an organism called Dermatophilus congolensis. This can occur when the horse is in a damp environment for a considerable period of time. While the organism can stay on the skin of the horse, humidity and moisture can cause multiplication, which can lead the disease. Symptoms: You may find bumps on the skin of the horse, which may feel like insect bites. Eventually, the skin may turn flaky and scabs may appear. While rain rot doesn’t really cause pain, it can be uncomfortable. Treatment: The horse must be moved to a clean and dry area, and there are special rinses and shampoos available that can be used for rain rot infections. The length of the treatment depends on the condition, and spot treatment is viable if the infection is not bad. Don’t try to pull off scabs that have not healed. Disinfection of habitat is recommended after treatment. Called fungal dermatitis, ringworm can cause the skin to look scabby and crusty, especially around the chest, shoulders and face. This is a type of fungal infection, which can be caused by many organisms. Note that such a skin condition must be treated, or else it will continue to spread and can affect the entire body. Symptoms: The symptoms can be similar to rain rot, but typically, the scabs and patches are round and flaky. Treatment: Always isolate the suspected animal from others and, make sure to talk to a vet. Treatment typically involves antifungal medications. Also called pastern dermatitis, this is a bacterial infection that causes inflammation of the skin. Caused by a bacterium called Dermatophilus congolensis, it may seem similar to rain rot in some cases. Symptoms: Hair loss, skin that looks raw, and crusty scabs are common symptoms of mud fever. In some cases, there can be swelling around the scabs. Treatment: Varied antimicrobial soaps are used for treatment, but ideally, it’s necessary to keep the horse clean and dry. Muddy pastures must be avoided. 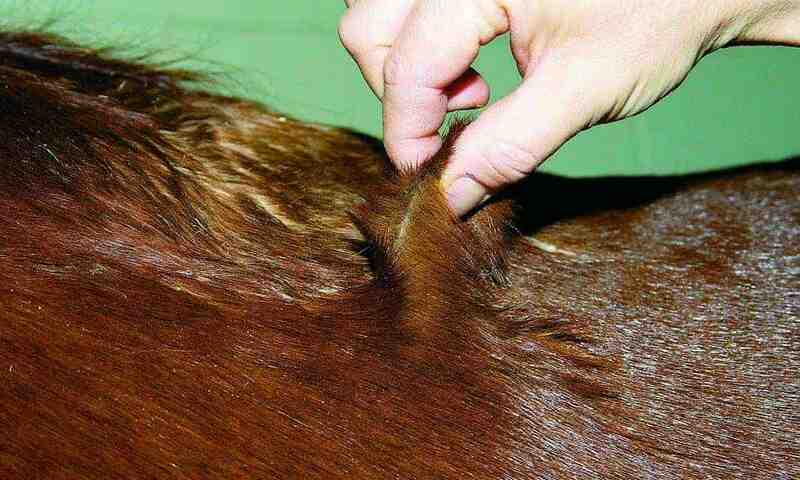 Talk to your vet about horse skin care for prevention of such diseases. Alopecia refers to baldness, and while this is not a specific skin disease, it can be triggered by a number of factors. Symptom: You may find patches of skin missing from the horse’s body. Treatment: The causes of alopecia determine the treatment, and if that’s done right, hair will grow back. It’s also important to avoid other skin infections, parasite related diseases. Check online now to find a reliable vet for your horses, and do get regular checkups done to prevent these skin diseases.